Smoky chanteuse plays accordion & sings soulful cabaret with hints of torch & jazz, blues & sass. CDBABY Editors Choice & 5 STAR Recommendation ! "Armed with an accordion and a chilling voice that borders on eerie in precisely the right way..." > . San Francisco Bay area vocalist, composer, musician, Tara Linda weaves unlikely bedfellows into playful song with tales of goddesses, fearless girls on trapeze, and blue fur monkeys. Her songs are spacious & soulful. Stylings, minimal. With a tinge of jazz & blues, torch & sass, and accordion too! "...percussion that slinks over and under, allowing the songs to be full but not distractingly big". "...lyrical content that deserves to heard". “What spooky loveliness. This woman's voice is like a cool glass of water, and her soulful cabaret is the perfect soundtrack to a lazy afternoon....the kind where you fall asleep in the grass and find yourself in the middle of bizarre circus dreams, and you're not quite sure if that lovely accordion wielding siren is coming to save you or poison you, but you can't help but want her to come closer...." ~ Val Esway, Soup and Song, August 1, 2006. “…There is only one other performer who pierces right through the soul with her music, Lila Downs. Tara has that unique quality about her voice. Te destroza el corazon and leaves you wondering what the hell just happened. I truly recommend checking out her performances...." ~ Gilbert Reyes, Reyes Accordions Webring, September 17, 2006. Armed with an accordion and a chilling voice that borders on eerie in precisely the right way, this disc follows the tumbling progress of a woman who has a firm grip on minimalism, both lyrically and musically. Shooting for abstract blues but simultaneously landing in the depths of jazz, these songs are strangely fun to process, asking the listener to allow for benefit of the doubt without laying on an air of thick pretension. The accordion is the structural basis for the tracks(along with the vocals), but it's the percussion that slinks over and under, allowing the songs to be full but not distractingly big. This alleviated space leaves room for lyrical content that deserves to heard, musings that at times seem disjointed but always pull back together in the end: "On a train 'cause I can't fly... On a boat 'cause I can't float." There's no doubt she's going somewhere. This cd requires a little investment. There is a simplified complexity (complex simplicity?) to these songs – insightful lyrics, space & melody – that I think requires more than a quick listen before they really grow on you. There is a lot of variety on the album, ranging from some jazzy torch songs and downbeat rock to even an a cappella/ remix of a 20’s hit, which makes the music genre difficult to classify. 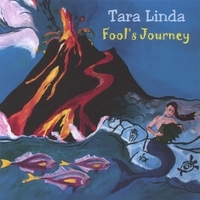 The variety you may or may not like, but personally I think its cool to have the accordion mixed in with rock and jazzy songs, and Tara Linda’s voice is dark & flowing throughout. Recommend if you are looking for original, eminently listenable music.